Keeping track of your progress when you’re losing weight has obvious benefits – not only does it allow you to see what’s working and what isn’t, but documenting your success also provides easy motivation to keep going when things get tough. But what, exactly, should you be tracking? Rather than focus on weight alone, experts recommend tracking multiple metrics over time in order to get a more thorough picture of your progress. And remember: the key to good weight loss tracking is consistency, so always try and replicate the same conditions every time you take a measurement, whatever it is you track. Regularly taking measurements at set points around the body is a great way to check if you’re losing inches, even if you’re not losing weight. Feel free to add any points of measurement that are meaningful to you. The Myotape is a genius invention for easily taking your own measurements. Rather than fumbling around trying to hold two ends of a tape measure together, the Myotape hooks into itself to make a loop, making it much easier to measure your upper arm one-handed. It’s hard to see the changes you’re making to your body when you look at yourself in the mirror every day. The only way to notice real progress is by taking photos over time and looking back at the ‘then’ and ‘now’. For a complete picture of your progress, take one photo from the front, one from the side and one from the back, and repeat regularly. We put together lots more helpful information on how to get clear, comparable photos every time in our guide on How to Take Awesome Progress Photos. It’s super easy to use your cell phone camera to take photos – you can even use the inbuilt timer to take photos from the back. 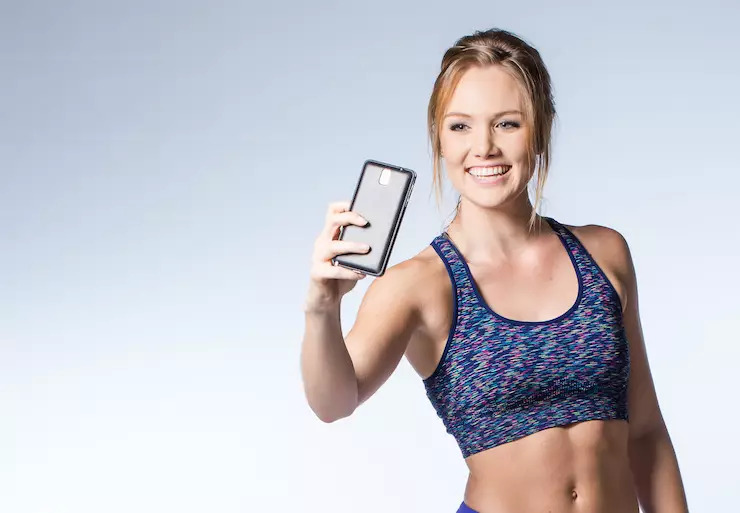 Of course, you can also use apps like Progress, which allow you to log your progress photos, weight, measurements and other body composition metrics, all in one place. See what works for you! Tracking body fat percentage is the easiest way to see if your hard work is paying off. After all, most of us are working hard to lose excess fat, not just ‘weight’. If your body fat is going down, you know you’re on the right track, even if your overall weight stays the same. There’s a whole host of methods available for measuring body fat percentage, ranging from free online calculators to expensive, high-tech DEXA scans. You can read about the various methods for taking measurements in our guide to measuring body fat. While the bathroom scales can be misleading in isolation, tracking weight as part of a range of measurements can actually be quite useful. This is particularly true if the scales are so ingrained in your mind as an indicator of weight loss that other measurements only seem meaningful when viewed through this lens. With the right set of scales, you can also monitor body fat percentage, muscle mass, and other body composition metrics, giving you an even broader picture of your progress. Take your pick! You can easily find inexpensive bathroom scales that just display weight, or you can go fancy and invest in a model that includes body composition measurements. We use the TSEC Smart Body Fat Scale because we like the analytics and, at under $60, it’s pretty affordable too. And that’s it – it really is that simple. If you track these four metrics regularly, you’ll have a thorough overview of your progress that will allow you to gage success, stay motivated, and make positive decisions to move you forward. In fact, why not download our free tracking guide below? It includes a handy visual body measurements guide so you know exactly where to position the tape measure for best results. Happy tracking!